Jupiter's famous Great Red Spot is astonishingly twice the size of the Earth. The Great Red Spot on Jupiter. Jupiter is the fifth planet from the Sun is the largest planet in the Solar System. Jupiter is a gas giant planet (the only other gas giant planet is Saturn). The planet was named after the Roman god Jupiter which when viewed from the Earth is the night sky's third brightest object after the Moon and Venus. The significant percentage of mass on Jupiter is made of hydrogen with only a quarter mass of helium. Jupiter has 79 moons which include the largest moon known to humankind, Ganymede, with a diameter greater than the planet Mercury. 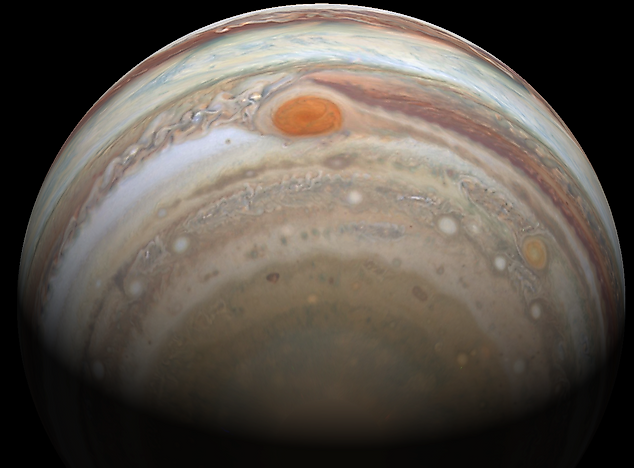 The Great Red Spot on Jupiter is a giant storm that has been known since the 17th century when it was first observed on a telescope. It has been observed continuously since 1830. The Great Red Spot is located 22 degrees south of the equator of Jupiter. It is an anticyclone swirling around a center of high atmospheric pressure which makes it rotate in the opposite direction of hurricanes found on Earth. With over 400 miles per hour of tumultuous winds, the Great Red Spot has been swirling wildly as seen over the planet's skies for the past 187 years (and probably more). Such storms are a common phenomenon within such turbulent atmospheres found in gas giants. Jupiter's famous Great Red Spot is an astonishing size at about twice the size of the Earth. There is a possibility that the Great Red Spot was in existence even before the year 1665. However, the present spot was not seen until after the year 1830, and was only well studied in 1879 following a prominent apparition. There is a long gap between the periods the Great Red Spot which was discovered when it was first studied after 1830. It is still unclear if the original red spot disappeared and reformed later or whether it faded away. A good example is Robert Hooke's description of the Great Red Spot in 1664 as a spot on the planet and a later description by Giovanni Casino of a permanent spot. Both the spots had some degree of discrepancy compared to the original spot. The first detailed image of the Great Red Spot was transmitted by spacecraft Voyager 1 on February 25th, 1979 at a distance of 5.7 million miles from the planet. At the beginning of 2004, the Great Red Spot had reduced to half its original longitudinal size and is expected to reduce to a circular shape by the year 2040. However, this may be unlikely due to the aberration of the surrounding jet streams. No one knows if the changes on the spot are caused by normal fluctuations or exactly how long the spot will last. There exist a smaller spot which formed in March of 2000 known as the Little Red Spot. Once every two years, the two Red storms pass by one other. Another storm turned red around May in 2008. The Great Red Spot is not the same as the Great Dark Spot, thus the two should not be confused. The Great Dark Spot is a feature located near Jupiter's northern pole that was observed by a spacecraft the Cassini-Huygens in the year 2000. Another feature known as the Great Dark Spot was observed in Neptune's atmosphere in 1989 by Voyager 2, but it has not been present since 1994.